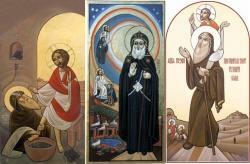 Saint Bishoy, the righteous and perfect man, the beloved of our Good Savior! Saint Moses the black and strong! I will build My church, and the gates of Hades shall not prevail against it! God is REAL?!... umm... well... PROVE IT! "God, God, Where art thou?"